My first chuckle of the day. Okay. I’m not finding amusement from the frightening thought of North Korea having successfully tested a nuclear weapon. This certainly gives me the shivers. I can only imagine what it’s like in North East Asia…to be a person in South Korea, China, Japan and even in North Korea. Scary. 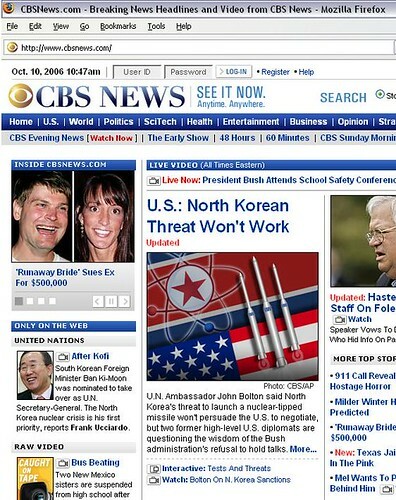 But, when I came across the above “front page” of a seemingly respectable American news agency (edit: to me, respectable no longer), I couldn’t help but chuckle. 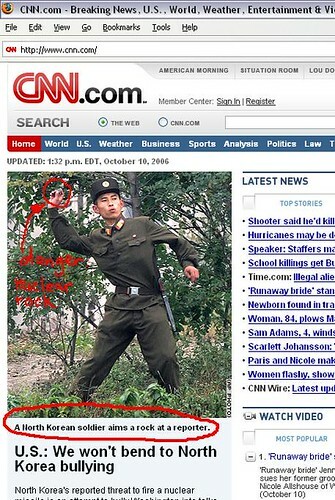 Why would CNN plaster a photo of a North Korean soldier throwing a pebble? Or perhaps CNN is wanting to convey that the North Korean test is well…really not that threatening after all, as Bolton so boldly declares. I’m no expert in global politics, foreign policy, international law, blah blah blah. I’m just a regular schmo trying to make sense of this world in which I live. I’m also not an expert in media, journalism, news ethics, blah blah blah (that’s why I have a blog!). But I can’t help but think–after seeing CNN’s front page at mid-day–to continue my growing skepticism of news-tellers who want not only to tell me what’s going on, but how to think about what’s going on. 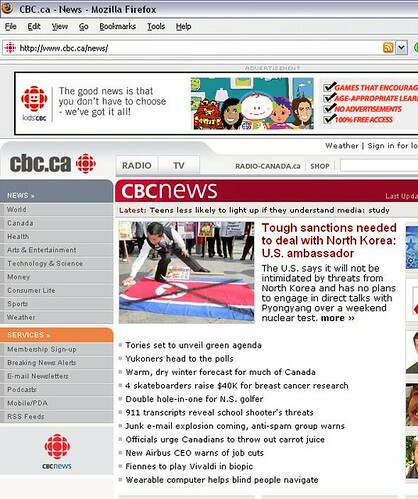 Good ol’ CBC: Polite. Accurate. Fully funded by Hockey Night in Canada…for now. 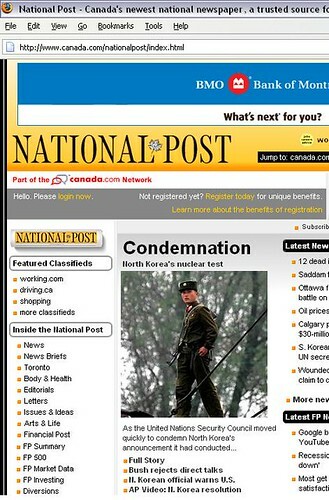 National Post: Now that’s a soldier who looks like he means business. Notice his weapon of choice. 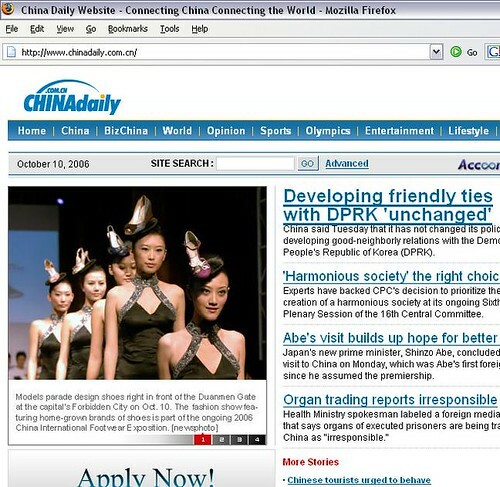 Hmmmm… Headline should be: “Unusual High Heel Growth Appearing on Heads of Chinese Women” =P (Hmmm…to see the only mention of the nuke test you had to scroll down one page to see a one-liner link). interesting entry =) you’re right, it’s a bit hard to believe that the N. Korean soldier chose a pebble to be his weapon of choice, when he obviously had something *slightly* more powerful & destructive hanging off his belt. who knows what’s been cropped from the photo… perhaps dozens of reporters trying to throw even bigger rocks at the soldier? Larry King is big enough of a reason for anyone to NOT watch CNN…worst interviewer EVER! A good piece of rhetorical analysis and bias detection. Reminds me of Social Studies 9. I found the contrast with The China Daily a real hoot. I think applying the rock throwing parable to countries is apt. I can’t understand how some countries have the audacity to set the rules on the international playing field when they play dirty themselves. The thing is, in this dog-eat-dog world, who is going to stop throwing first? Or even stop gathering rocks in the first place?!! Is no one else curious as to why the runaway bride is suing her ex for $500,000? …perhaps it’s just me 😀 I like lawsuits!